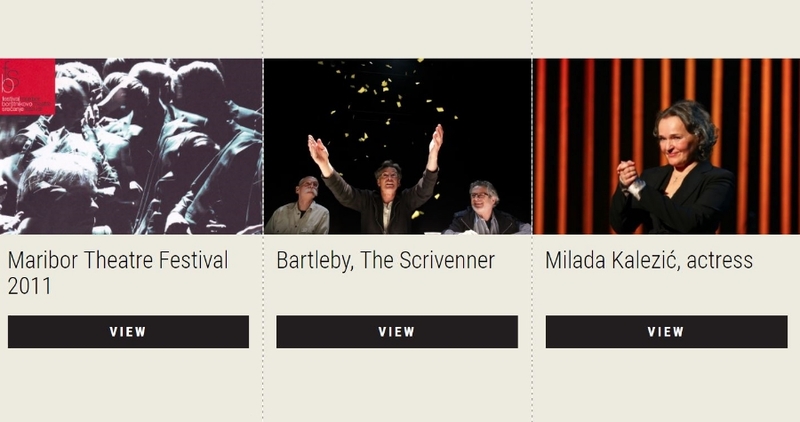 A virtual exhibition prepared by the Maribor Theatre Festival, Novi ZATO. Institute and the Slovenian Theatre Institute in collaboration with Prodok teater TV, the Celje Historical Archives, the archive of the Centre for Theatre and Film Studies at the Academy of Theatre, Radio, Film and Television, University of Ljubljana (CTF UL AGRFT), the Slovene National Theatre Drama Ljubljana, the Drama of the Slovene National Theatre Maribor, Slovene Mladinsko Theatre, Celje People’s Theatre and Mini teater Ljubljana. The jury for the Borštnik Ring Award (Aleš Jan, Mateja Koležnik, Tone Partljič, Alja Predan and Milena Zupančič) bestowed the Borštnik Ring 2011 to actress Milada Kalezić. The jury awarded The Grand Prix for the Best Production of the Maribor Theatre Festival to the production Herman Melville: Bartleby, the Scrivener, directed by Miloš Lolić and performed by Mini teater Ljubljana. The Award of the Association of Theatre Critics and Researchers of Slovenia for the Best Production in 2010/11 went to the solo performance MandićMachine by Marko Mandić, directed by Bojan Jablanovec and produced by Via Negativa Ljubljana and SNT Drama Ljubljana.